Patrick Saunders is an artist, painting and creating fine art across North America. Patrick Saunders is a painter creating fine art while traveling North America in an Airstream with his photographer wife, Kimberly. He has studied with many renowned painters, including Mark English, Malcolm Liepke, Wilbur Niewald, Richard Schmid, and Burton Silverman. 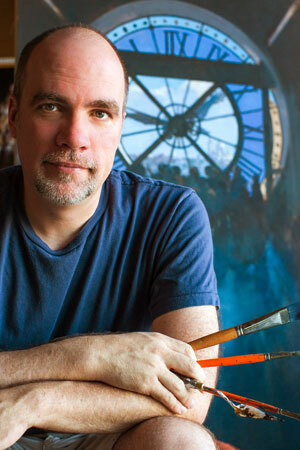 Patrick paints a variety of subjects, including portraits, landscapes, cityscapes, and florals, and frequently teaches workshops during his travels. After graduating from the Kansas City Art Institute with a BFA, Patrick spent a decade as an artist at Hallmark Cards before returning to the KCAI to accept a full-time faculty position teaching illustration, painting, animation, and web design. Teaching led to a job offer in advertising, where, as a Group Creative Director, Patrick led teams of marketing professionals in New York, San Francisco, and globally, producing advertising for clients such as Colgate-Palmolive, Whole Foods, Hill’s Pet Food, FedEx, Revlon, Southwest Airlines, Tom’s of Maine, Nextel, Skyy, Kashi, and Kellogg’s. Throughout his career, Patrick has been recognized for outstanding work, earning awards from the American Advertising Federation, the International Academy of the Visual Arts, the Web Marketing Association, the Society of Illustrators, and Communication Arts. He was featured by Southwest Art Magazine as one of their 21 Artists to Watch Under 31. His KCAI students voted to honor Patrick with an Educator of the Year award. Patrick is a Signature Member of the Laguna Plein Air Painters Association, the Oil Painters of America, the American Impressionist Society and the Outdoor Painters Society. Patrick is represented by Eva Reynolds Fine Arts, Inc. in Kansas City and the Trippe Gallery in Easton, MD.